Human well-being is a direct function of power consumed, or the rate at which work is done. The relationship between rate of energy consumption and rate of wealth production should not surprise anyone. The faster work is done (more power consumed), the more wealth that is produced. It is impossible to think of a single wealth-producing activity that does not require work—the expenditure of energy. The great increase in the world’s wealth since the Industrial Revolution is the obvious outcome of using fossil fuels to provide the energy for machines to do work. We got rich in the last couple of centuries in large measure because we used so much fossil energy. If we are not able to maintain high-energy consumption rates, the data summarized below strongly suggest that we will get poorer, sicker and less educated. 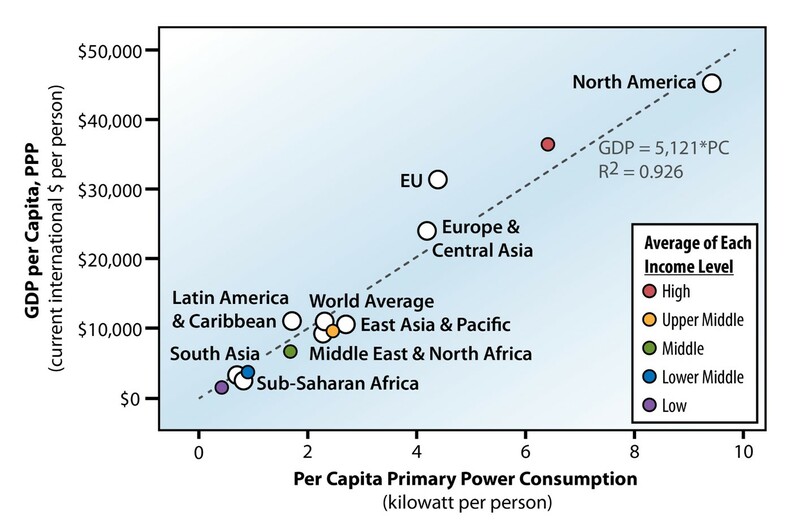 About 93% of the variation in per capita wealth production (GDP per capita) between different countries can be explained simply by how fast they use energy—the power they consume—as seen in Figure 1. A broader measure of human well being than just wealth includes the Human Development Index (HDI), a composite measure of expected life span, expected years of schooling and wealth. Figure 2 shows that HDI rises rapidly with increased power consumption and levels off at about 2-4 kilowatts (kW) per capita. 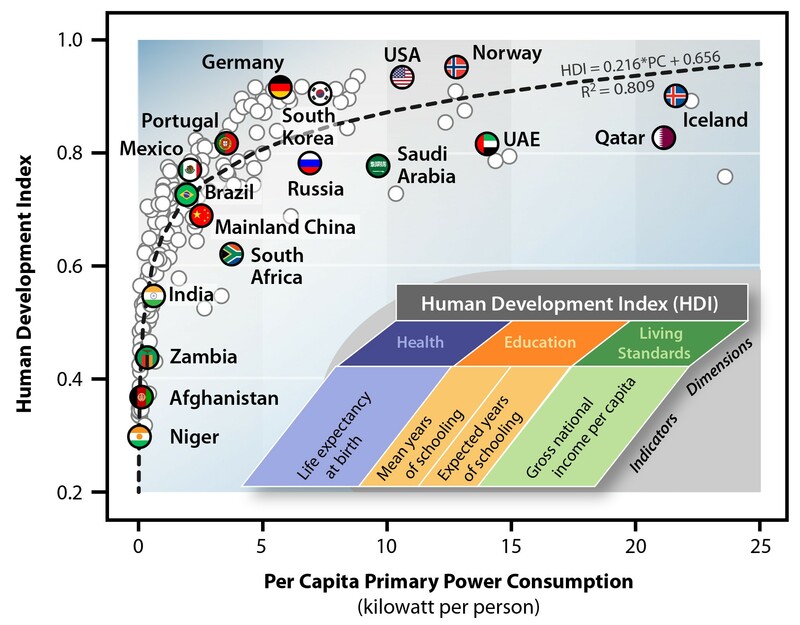 Apparently we need about 2-4 kW per capita to achieve good levels of health, education and wealth. The numbers are sobering. If everyone on the planet were to consume 2 kW of power, we would need about 14 terawatts overall…roughly the current world power use. If everyone were to obtain a more comfortable life using 4 kW instead of 2 kW, the total world power consumption would need to double. Where would that energy come from? Approximately 85% of current world energy use is from fossil fuels: coal, oil and natural gas. These are non-renewable resources. When they are exhausted, the wealth they produce will likewise disappear. Peak (cheap) oil arrived in 2005. Peak coal and peak natural gas are yet to come, but they will come simply because they are not renewable. Peaking and decline of non-renewable resources is not a matter of politics or economics or philosophy, it is a matter of physics and geology. Thus very large-scale renewable energy systems are not just a “good idea”; they are essential. If we do not implement large-scale renewable energy systems now, we can count on being poorer, much poorer, in the future. Please share your thoughts on this analysis of the relationship between energy consumption and wealth production and human well-being. The theory seems rational albeit academic. However, the discussion of “peak” oil, coal, gas, etc. is flawed. “Peak Energy” has been predicted over and over again for decades, and has been consistently wrong. Oil may be a bit more costly to find and develop, but the cost of production is controlled by modern technology such as seismic mapping and fracking. Coal production inthe US is down for lack of demand / regulatory concerns. US oil production is on the rise. There is no peak oil in sight; in the world or in USA. Same is trrue of nat gas. The advent of renewables is, for the most part a political, quasi religious, driven issue. Renewables are not needed to support wealth production in the real world. In fact renewables add to the cost of wealth production. The real issue is the cost of continued wealth production on the scale necessary to mitigate widespread global poverty, chaos, and violence. Moreover, while fossil fuels probably will become more expensive in the long run — and already impose other, undesirable costs — if by “renewable energy” Dale means solar, wind, or biofuels, those are not the only other options. More advanced fission power technologies — notably, using thorium — can replace fossil fuels for generating electricity (or even creating gaseous or liquid fuels), with greater safety and less waste than traditional LWR technology. They also may extend the supply of nuclear fuel by ‘breeding’ and could even use byproducts now considered waste to provide additional useful energy. An analysis done at the U. of Washington indicated that commercial CFRs (UW has a design of its own) could produce electricity more cheaply than coal. Because CFRs could be mass produced, they would drastically lower the cost of power plant construction. And their modular design would allow them to be scaled to match demand. The currently most efficient fusion cycle uses deuterium and tritium, which is obtained by ‘breeding’ from lithium. Estimates suggest that the current reserves of lithium could fuel fusion power for 1,000 years. Additional lithium could be obtained from the moon and/or asteroids. The moon also has abundant Helium3, which also could be used in a fusion reactor. I read the Physics Today article and followed up a bit on the related stories. Maybe there is something there, but we will not know for sure until a lot more work is done. It seems a pretty slender reed to lean on. I don’t think “hope” is a good strategy for providing long-term energy. Even if this idea works to perfection, there is still the problem that most of the renewables and non-renewables may give us abundant electricity, for light, heating and power. But for mobility services, electricity can only provide part of the answer, at best. We need replacements for petroleum to provide complete mobility services. And it is precisely petroleum that is now at peak. Bruce, we have gone back and forth about your peak oil arguments multiple times. I think we are now well into the “agree to disagree” stage. As you suggest, it may well be unrealistic to count on all future technologies innovations to be successful. But then it is just as unrealistic to expect them all not to be successful — which is what the case for “peak oil” largely rests on. The standard case against “peak” anything arguments is that the supply of any resource — indeed what makes something a “resource” at all — depends on the technology used to exploit it. The sufficiency of the future supplies of a resource, tied inevitably to demand and price, is as inherently uncertain as the future state of technology. Implementing most renewable energy systems (except for hydroelectric power) now, as you recommend, can only mean raising energy costs and increasing poverty. India and other developing countries will not accept that deal. And Lynas argues (correctly) they should not. Excellent observations and wise analysis, Mr. Shortt. I have been in renewable energy since 1981 (!) and can attest to the Gloom and Doom theories about when we will run out of fossil fuels. As you say, these are always wrong. The sky is not falling, and most Chicken Littles are (knowingly or not) promoting an egalitarian socioeconomic shift of global proportions that (surprise) will involve the Taking of wealth from nations who seized upon the Industrial Revolution to increase their wealth and standard of living, to the nations who did not. Now that colonialism and slavery are long gone, the only viable explanations for why Second and Third World countries remain so are: lack of functional governments, elected by the people; lack of functional courts governed by the Rule of Law; lack of Bill of Rights style personal freedoms, and, last but not least: lack of any acknowledgement that restrained capitalism is the best idea to bootstrap your way into First World status. Free solar cells for everyone in the world will not, in and of itself, make anything better. America and the world needs electricity, that is a fact. Renewable energy is coming, but we will still be needing our fossil fueled power plants for many decades yet. Power plants are inefficient. They all have these big chimneys that spew a lot of combusted heat energy into the atmosphere. Why is this still allowed? Our governments and utilities push Energy Star appliances and other methods of conserving this energy at work and at home. Let’s go back to the source and Increase the Energy Efficiency of these facilities. There are things that can be done with all this waste exhaust that will create jobs and profit. Global warming and CO2 emissions can be greatly reduced. This is one area where America needs to put some focus, if we are going to make a difference. When were these pronouncements made? I’m mainly with Jack and Lewis on this. The end of the age of oil/fossil fuels/etc. has been pronounced regularly for the past 100 years, along with the sense of great urgency that something–often to be directed by the government–must be done immediately. That something usually meant a programmatic effort to commercialize a favored alternative technology. There will, I expect, be a transition one day to much greater efficiency, renewables, better nuclear power technology, and other means of providing the world with electricity and transportation. But this transition will take place over generations. A programmatic national effort to make something like this happen quickly, to judge by history, has always led to extraordinary waste and few enduring benefits. By the way most of the quotes came from a 2011 post on the web site masterresource.org. The problem is not that we will run out of fossil fuels, the problem is that we won’t. Climate scientists tell us that we can’t burn more than 20% of the known fossil fuel reserves if we want to have a chance of staying below +2ºC (and some climate scientists say +2ºC is too high a target if we want to avoid catastrophe). And while some people said wrong things in the past, that does not mean we should ignore the warnings of climate scientists. Many good points, thank you. I agree that government-directed crash programs are likely to be wasteful and even self-defeating. But given the very long transition times between energy systems, which you correctly point out, I think we need to make the best choices we can as individuals, organizations and a society to provide long term energy for ourselves and our descendants–and move ahead. There is waste and mistakes in all human activities. I carried life insurance for a long time and never needed it. Were my premiums wasted? No, I don’t think so. I believe building out renewable energy systems using the best thinking and planning we can, realizing that we will make mistakes, is still the responsible thing to do. Your comments throughout have been thoughtful and gracious, and I’m pleased to participate in a conversation that has the positive tone that you have set. I am for a robust research program with continuity of budgets and effort. But organizing a program with an eye toward mass commercialization is in my view a mistake, and with respect to energy, has never worked. You are not wrong to take out life insurance–I have had it myself for many years–but you probably would be wrong to purchase it if no one before you had ever died. Here we have the reverse; the programs are either dead or on perpetual life support. I don’t think putting billions of dollars into something that produces mainly more ICU patients is a wise plan, and while I have seen many plans for creating successful commercialization programs, I am skeptical that any of them could ever be successful. I am especially sympathetic to Dr. Bruce Dale’s posting and also the follow up by Dr Grossman. While we need to look at and develop the alternatives , yes, but as the developer of EROI (energy return on investment, published since 1979) I would like to point out that many of our marvelous new “greener” / direct solar technologies appear to have a much lower EROI than fossil fuels. For example I had been very enthusiastic about thorium but recently read a review by one of the great Ok Ridge early physicists (it was not Alvin Wineberg, whom I knew) who said they tried about everything with thorium reactors and could never get them to work –it was a very sobering piece. I can find reference if needed. 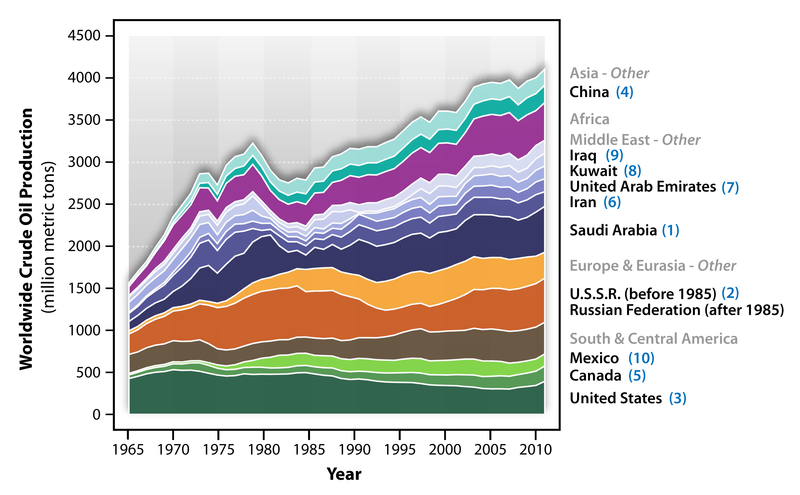 Peak energy has not been predicted (except for long time periods) but peak oil has, and if we are talking about real oil (not NGLs, refinery gains etc) in fact it has indeed been flat for all of the world except the US ) since 2005 , and nearly all oil producing countries (except the US and some big middle eastern countries) have shown very clear Hubbert Peaks. (Hallock, Hall et. al.). I think declining EROI of our main fuels, material constraints of many options, including increasing energy costs, and the low (but increasing) EROI of many of the options (esp. if backups are considered if integrated at large scale), and the failure of our construction of a national independent/objective/comprehensive EROI/Peak oil Institute means that we are not able to develop policy out of the morass of advocacy. I also recommend that if anyone thinks that fracked oil/gas is going to do any more than give us a few years/decade breather please look at David Hughes recent report. This report also reinforces my view that we are getting advocacy, not analysis , from our government information gate keepers. SO I agree with Bruce’s last paragraph (and the rest) but think we need to do very careful EROI analysis of the alternatives to avoid other boondoggles such as the US corn based ethanol which has probably delivered pretty close to zero net energy to society. Bruce is a good careful analyst and he understands these things.. Here is a nice article from Business Week that points out that CA’s rules change in the 70’s under Jerry Brown changed your equation. You also advocate “large scale.” Many would argue that the countries without large scale energy infrastructure can bypass the development process that we have followed and create a much more resilient and distributed system without loosing the ability to develop economically. California’s economy and per-capita GDP are in perilous decline. From 2000 to 2013, California added one job for every 11 new residents. It is the only state this side of the civil war to have paid its government debts with IOUs. It has a history of epic energy mismanagement including unforced rolling blackouts. It has overfarmed its Central Valley, and over fertilized and overpumped and over irrigated, and this national breadbasket is now returning to sterile saline seabed. California is currently hemorrhaging $10 billion a year in industry fleeing to other states at a rate of more than 5 per day, leaving its tax base in shambles. Toyota and Occidental Petroleum are the most recent giants to announce their departures. Even its movie and media industries are relocating, and much of its vaunted Silicon Valley tech sector have moved their headquarters elsewhere. California’s self-proclaimed success in energy efficiency is mostly a product of its mild climate. When a state enjoys the fewest number of heating- and cooling-degree days of any in the union, it has no excuse not be the lowest in energy consumption per capita. California was born on third base but tries to claim it hit a triple. It is showing the world an example of how governing by feel-good ideology instead of practical reality is the path to self-destruction. Even a state as intrinsically blessed as California can be crashed by bad governance. My point was that growth in GDP and the amount of energy used no longer move in tandem …..Are you suggesting that CA’s climate has been dramatically changed since the 70’s, changed enough to allow the economy to triple and the population to double without increased energy use? Please don’t try to distract with a strawman (although it would be ironic to hear you argue against climate change in California). You seem to be defending a quote you like from the Bloomberg article, “California’s electricity consumption has remained little changed over the past 40 years, even as the state’s population doubled and its gross economic product tripled.” So let’s discuss that. Are you saying that the governor’s office leadership over those 40 years is responsible for this performance? If so, then you must be arguing for more of the pro-business, anti-regulation policies of the GOP that held the governorship for 25 of the past 40 years. Of course, the last Democrat to hold the Governorship before Brown, Gray Davis, made history by being recalled for energy policy ineptitude, strengthening that argument. Perhaps we should compare California to the nation as a whole. Guess what, the whole country has seen a trend of decreasing energy intensity per dollar of GDP since WWII (http://www.eia.gov/todayinenergy/detail.cfm?id=10191 ). This is mostly due to two factors. The first is the wholesale de-industrialization of America as factories and their jobs have been shipped overseas due to costs of labor and EPA compliance. We are now an 80% service-based economy. The second factor is the increasing energy efficiency of all sectors of the economy. Increasing energy efficiency is a universal international phenomenon tied to improving technology, not something to which California has any exclusive claim. Perhaps we should examine what else drives flat or reduced energy consumption. Is it legislation? Not unless it is strict rationing or direct price manipulation. Is it spending billions building new, duplicative generation and transmission capacity to promote renewables? No, except for its effect on increasing prices. Is it price? Bingo! When the price goes up, consumption goes down — Econ 101. So California deserves the credit for keeping energy prices high enough to discourage consumption. Congratulations. As more industries leave California because of this effective policy, the state’s energy intensity will further decrease. Be careful what metrics you pick to define success. By your standards, California wins when its grid goes dark. Good Heavens! “California wins when it’s grid goes dark”? What I said was that CA changed their ratemaking policy to not make rates dependent on the amount of energy generated and sold. Those changes by CA’s utility regulators under Jerry Brown in the 70’s resulted in changing the relationship of CA’s GDP and the amount of energy used. A change in ratemaking rules … not 40 years of politics! The NRDC paper references a Rand sourced discussion of price elasticity and electricity demand. I have not read the paper but evidently most people are unaware of the Kw/hr cost of their electricity, mostly just their bill total. Over the 30 years in question, the rules change has allowed CA to avoid building about 30 large power plants, saving consumers a lot of capital expenditure on their electricity system. In actuality CA has lower average monthly bills than it’s neighbors and other large populous states. NY has a higher average rate, but CA has lower average bills than NY and all the compared states. What Dr. Dale has included in his brief post is excellent context for a discussion of the energy needs of civilization, but is necessarily incomplete. Just looking at the huge appetite for energy in terms of quantity misses the quality dimension that is just as vital. Dr. Hall added EROI to the discussion, and he is the authoritative source in that field. Modern civilization not only requires huge quantities of energy, but it needs high quality energy, with attributes of high energy density, high power density, and high EROI. Human civilization is a giant organism, and energy is its food source. The emerging scientific fields of biophysics, biodynamics, and econophysics all have much to tell us about the energy needs and growth trajectory of civilizations, and they all need to be applied in the spirit of Howard T. Odum, who pioneered such a synthetic approach to ecology and economics. The school of biophysical economics, which is his offspring, marries these approaches together in attempting to quantify the inputs and outputs of the human and environmental ecologies, and how they might perpetually co-exist. For almost all of its six-millennia recorded history, human civilization lived on agricultural energy, which is to say photosynthesis-derived food and animal feed crops. The peak EROI achieved within this paradigm using wheat for human food and alfalfa for oxen was about 1.8:1 during the apex of the Roman Empire. Agricultural civilizations depend upon human and animal slaves to construct their cities and temples and monuments, and history shows that, even if they survive all other threats, they eventually succumb through logistical failure and starvation by deforesting and overfarming all the land within their reach, and having to conquer more and more land until they exceed the limits of their power to subdue their holdings. In other words, the highly successful civilizations ultimately outgrew the environment’s ability to provide their food and energy needs. The discovery of coal and petroleum and the shifting of civilization from low-EROI/high environmental footprint agricultural energy to high-EROI/low environmental footprint fossil fuels, paired with steam and internal combustion engines to exploit them, dramatically changed the trajectory of human civilization. Today’s industrial and post-industrial developed nations enjoy and depend upon finished fuels with 10:1 or better EROIs. Instead of spending most of today’s energy finding and assimilating tomorrow’s energy (i.e., subsistence living), civilization now has a huge energy profit to shift into the other biodynamic energy budget functions such as repair and maintenance and maturing and increasing in complexity and reproduction and growth. Primary energy sources with at least 6:1 EROIs are necessary to keep their energy-intensive economies from sliding into recession and their infrastructure from decaying via economic catabolism. Industrial-age civilization has been able to accumulate population and infrastructure at unprecedented rates, in a reinforcing spiral of energy profit turned into new technology, applied to an expanding diversity of natural resources, transformed into new wealth. Human civilization has essentially transitioned from a heterotrophic organism dependent upon seasonal solar energy to an autotrophic organism capable of making its own food out of resources other organisms find inaccessible and inedible. The chief example among many include making enriched uranium, with millions of times the power density and an order of magnitude higher EROI than petroleum, out of pitchblend ore, which no previous civilization or organic creature could have recognized as an energy source at all. The recent autotrophic advances of learning to access and assimilate source rock shale gas and tight oil, and to reach huge reservoirs of pre-salt oil miles below the oceans, are just natural progress. The EROI achieved is a function of both the resource and the technology used to assimilate it, and the EROI of fossil fuels, while oscillatory with capital investment, remains high. A very insightful application of econophysics to both primary energy and emissions is made by Dr. Tim Garrett. He has looked at human civilization as a thermodynamic heat engine and discovered a linear relationship between civilization’s cumulative wealth (i.e., time integral of global GDP) and both its energy appetite and CO2 emissions. His simple equations better match the observed energy consumption and emissions profile than those of pure economists. And they explain why increasing energy efficiency does not reduce energy demand nor emissions, but rather increases energy appetite in accordance with the well-established economic principle of Jevons’ Paradox. His equations also predict that attempts to curb GHG emissions are futile, except by the destructive reduction of GDP. These principles also match biological laws, where resource consumption and waste production are inescapably linked to body mass and metabolic rate. As for “peak oil,” we are no more there today than in 1919. We have just passed though another cycle of perceived shortage and price spikes, which precipitated another wave of capital investment, which produced another glut of petroleum and gas. Prices are predictably collapsing, and the 80-odd and growing number of oil-producing nations of the world are now beginning the fight to preserve market share that will last for another decade or so and bring oil prices through another bathtub curve like it did the last cycle for the 17 years from 1986 to 2003. Oil demand and flagging economies continue to limit petroleum demand and production, not scarcity as so many fear-mongers claim. When the world does shift away from petroleum and coal and natural gas, it will be toward some form of nuclear power, just as Marion Hubbert predicted in 1956. And the shift will be because the new form provides better quality than than the old, not because we ran out of the old. I include no citations above because the interested reader can find 27 pages of them well footnoted in this document http://wici.ca/new/resources/occasional-papers/#no.4 . 1) We are rich because we consume a lot of energy, about 16 terawatt globally. 2) Most of that energy, over 85%, is from non-renewable sources. 4) Even if the whole crust of the planet were made of oil or coal or pitchblende or whatever, as responsible individuals, we would still need to be actively building out renewable energy systems, anticipating the eventual end of non-renewable energy sources. Again, I am not advocating right now for any particular renewable energy platforms, but I would be interested in knowing if anyone is opposed to this statement of principles? I don’t want to get bogged down in a discussion of Peak Oil right now, because that is not our topic. But I do think it is important to make a few points in response to some comments in this thread. It is well known that M. King Hubbert correctly predicted a peak in US oil production in about 1971. Kenneth Deffeyes, a Princeton geologist, predicted that peak global oil production would occur in 2005. See his book “Beyond Oil: The View from Hubbert’s Peak”, pg. xiii for the prediction. The attached figure shows that Deffeyes was right also. I believe we need to use energy efficiently. We will need to use energy efficiently anyway in a more energy-constrained future. But using non-renewable energy more efficiently just means you reach the bottom of the barrel (literally) more slowly. The bottom is still there. Thus we must have renewable energy, terawatts of it, if future inhabitants of the planet are to have the same opportunities that most of us have had. 9.7 +/- 0.3 milliwatts of energy consumption per 1990 US dollar of civilization’s net present value as time-integrated from World Bank annual GDP values for all nations. He arrived at this linear equation from a thermodynamic approach, but it is also derivable from a biodynamic approach. Energy consumption is proportional to body mass times metabolic rate. Human civilization is growing in mass (population and infrastructure) and also in metabolic rate (per-capita energy intensity of the average human lifestyle). Respiration (i.e., CO2 production) follows the same formula. Garrett believes growth in CO2 emissions is inseparably linked to growth in civilization and growth in energy consumption. Garrett shows mathematically that increases in energy efficiency surprisingly do not lead to decreased energy consumption — because they improve the growth efficiency of the organism, which thereby increases its growth rate, size and energy appetite. In other words, increasing energy efficiency increases quality of life, because the same amount of energy delivers more energy services; and this higher quality of life promotes growth of civilization, which results in a larger and wealthier human mass with an increased appetite for energy. He mathematically verifies Jevons’ Paradox by showing how the terms cancel each other out in his equations. A key point is that the energy efficiency of consumption cannot constrain the growth of civilization. However the energy-efficiency of energy production (i.e., EROI) can and does. EROI describes the quality of the food that feeds civilization. High-EROI energy fuels growth, while EROI below the threshold necessary to sustain whatever is the current metabolic rate leads to economic catabolism, aka recession and depression, or more properly, “contraction.” My literature research indicates that America and similar post-industrial economies currently need primary energy converted into ready fuel with an EROI of 6:1 or greater, or we experience economic decline. EROIs below 6:1 cannot sustain modern developed nations. They will regress toward agricultural-age civilizations which are sustainable with EROIs below 2:1. I believe the billions of people in the developing world who now can watch the developed world on TV will not be happy until they share the same standard of living. This means they will demand and must be served by the same high-EROI energy that serves us today, and will likely need even higher-EROI energy to bring them up to speed. This is going to be the same coal and oil that brought us up from goatherds to the space age. There’s plenty of both to do the job, and trying to fight this is futile and even immoral. Our best course of action is to help them with the latest technology to use fossil fuels as cleanly and efficiently as possible, to speed their progress, and to continue to work toward improved nuclear energy. However, we must realize that when nuclear energy finally achieves its promise, it will usher in an age of even higher energy-intensity and minimum threshold EROIs. Hoverboards and flying cars are very energy-hungry. Whether we have a nuclear breakthrough by then or not, most of the 11 billion humans of 2100 are going to be high-density urban dwellers in multi-story buildings; not living in a bucolic utopia of passive-solar, sod-roofed, single-family dwellings lit by wind turbines. They are going to require high power density energy at high EROI to feed them and carry away their wastes and power their lifestyles. Some people want to believe that high-EROI fossil fuels will “run out” before we make the nuclear transition. I believe ingenious autotrophic humans are up to the task and will deliver that nuclear energy long before fossil fuel EROI drops too low. When supremely useful liquid hydrocarbon fuels become too dear to synthesize from petroleum, we will synthesize them from coal or methane hydrates. Long before that thousand-year supply is up, we will transition to fission or fusion or LENR or some other nuclear alchemy and leave the rest of the fossil fuels in the ground. CO2 emissions will rise in direct proportion to civilization’s wealth, plant fertility and crop yields will continue to increase in response, the climate will do whatever it will do, and humans will continue to build ever more effective defenses to extreme weather just as they have for centuries past, continuing the dramatic trend of decreasing weather-related mortality that has marked the industrial age and continues today. Thanks for your direct response about the relationship between energy and wealth. I am reading the Garrett papers. They appear to be well-grounded in fact. However, I do not share his view that we must necessarily have increasing carbon dioxide levels to increase wealth. That is simply an opinion, not a demonstrated fact. I enjoy your use of hyperbole–I am afflicted somewhat by the same vice. 🙂 However, I am going to restrict myself to facts as much as possible. I don’t see any evidence that society is becoming some sort of heterotrophic organism. The evidence I see is that we are hugely dependent on a few energy sources and that we are already seeing the adverse societal consequences of depending on those few sources as oil, in particular, becomes more limiting. If I understand your argument correctly, we will eventually use abundant electricity from some nuclear source to synthesize liquid fuels directly from carbon dioxide. If you will send me good technical papers that deal with that possibility, I will certainly read them. But I don’t see the evidence that you are correct. 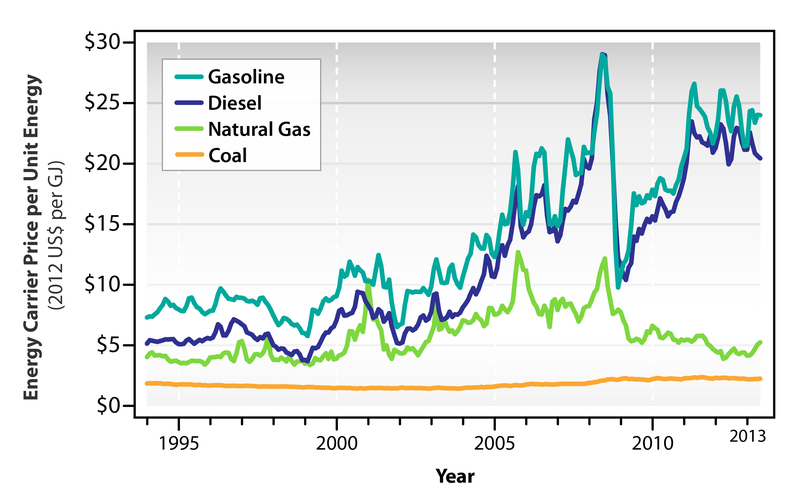 What I see instead is that gasoline and diesel, our two liquid fuels, have already diverged from coal and natural gas (our major sources of electricity) in dollars per gigajoule (see figure below) and that liquid fuels cost much more than other energy carriers than they ever have before. If I understand you correctly, we should have cheap nuclear electricity first and then synthesize liquid fuels in response to growing shortages, if they ever occur, of liquid fuels. Instead, liquid fuels are already much more costly than electricity and I see no movement at all toward using electricity from nuclear or other sources to synthesize liquid fuels. By the way, even currently cheap natural gas, at a 3:1 energy conversion ratio, would probably not be cheap enough to use to synthesize liquid fuels. We were promised decades ago that nuclear energy would be “too cheap to meter”. There is no evidence that that is true and a lot of evidence that it is not true. Se where is the cheap electricity going to come from to make liquid fuels? As I said in my response to Jim regarding “breakthrough energy”, I would be delighted to find that such a source of energy existed. But I don’t know of one. If you will send me papers that deal with this subject, I will certainly read them carefully. 2. Please give examples of hyperbole. 3. It is only natural that liquid hydrocarbons should be priced higher than solid and gas hydrocarbons because they are of higher value. They have higher energy density, are more easily stored/transported/handled, are more versatile in combustion (everything from open flame lamps to internal combustion engines to jet engines to rockets), and they are also feedstock for the entire petrochemical industry, producing materials as diverse as plastic toys and asphalt roads. What is amazing is how cheap liquid hydrocarbons have been, with an average price across the 20th century of $20-30 per barrel in year 2000 dollars. Looks like we are headed there again with $50-$60 per barrel crude in the next couple of years by my estimation, and that inflation-adjusts to the same price range. 4. I think you are playing coy about nuclear power and liquid hydrocarbon synthesis. Both of these are now ancient technology, not “magical thinking.” Making electricity from nuclear fission via steam generators has been commercial technology since the 1960s and is being adopted in a growing number of countries around the world. Uranium ore has turned out to be so plentiful that the market price is depressed, and this is only one of many possible fuel cycles. Nuclear is by far the safest form of electricity per unit of energy delivered (hydroelectric, not coal is the worst). Converting electricity generation from fossil to 100% nuclear is technologically and logistically and economically feasible today, but is hindered by public perceptions and lack of political will. As to hydrocarbon synthesis, it is only a matter of having a surplus of electricity matched with a scarcity of liquid fuel. Hydrolysis of hydrogen from water is well known. Synthesis of alkane hydrocarbons from hydrogen and CO2 via high temperature catalysis dates to the 1920 and two guys by the name of Fischer and Tropsch. Converting F-T synthesis paraffins into liquid fuel blendstock or true surrogate fuels is a matter of applying the well-practiced methods of cracking, isomerization, oligomerization, and fractionation, such as are being applied today to make jet fuel from butanol and iso-paraffins in the biofuels business with which you are very familiar. It’s not a matter of technology, its a matter of the huge negative energy balance of the process. It is much more economical and sensible for the foreseeable future to refine crude oil for liquid hydrocarbon fuels than to synthesize them from seawater or biomass. But 200 years from now it is a safe bet that nuclear power is going to be more efficient and ubiquitous than it is today, and thus producing cheaper and more abundant electricity, and crude oil may be more costly to extract and deliver a lower EROI, and the economics may thus swing to favor synthesis. Meanwhile, energy services that don’t require the higher value of liquid hydrocarbons are going to shift toward lower value solid and gaseous hydrocarbons. This is why home heating oil and oil-fired power plants are going the way of the dinosaur and are being replaced with natural gas BTUs in this country, and with coal BTUs in the developing world. I suspect we are not going to be any closer to agreement when I have finished this post, but I thought I owed you a direct response to a couple of your questions/comments. First of all, you asked for examples of hyperbole in your writing. The dictionary defines hyperbole as the deliberate use of gross exaggeration for emphasis, effect, or to illustrate a point. “Human civilization has essentially transitioned from a heterotrophic organism dependent upon seasonal solar energy to an autotrophic organism capable of making its own food out of resources other organisms find inaccessible and inedible”. I want to directly address your last statement, which seems like hyperbole to me, because it ties in with several previous comments made by you and alluded to by Mr. Loving. Your statement is symptomatic of what I think is a point of view widely shared by techno-enthusiasts: somehow we are becoming independent of nature. You state that we are becoming an organism capable of “making its own food out of resources other organisms find inaccessible and inedible”. Not so. We are still absolutely dependent on solar energy for essentially all of our food. We are still absolutely dependent on solar energy to generate all the oxygen we breathe. We are still absolutely dependent on solar energy to drive the hydrologic cycle that renews our fresh water supplies. So if you want to regard energy as our food, then the contributions of solar energy to our functioning as human beings still far outweigh all of the other energy sources combined. We are not making any such transition and we are highly unlikely to do so. To do so, we would have to be able to take carbon dioxide and water and generate all our edible food, oxygen and potable water by the input of energy. Plants are true autotrophs and they do this all the time. We are still very much heterotrophs and we do not have the energy-capturing mechanisms independent of plants to drive these reactions. As suggested by you and Mr. Loving I looked into the potential use of nuclear energy to convert carbon dioxide to mixtures of carbon monoxide and hydrogen (synthesis gas), from which liquid fuels might be synthesized via the Fischer Tropsch reaction. If we can do this, then perhaps we can become the autotrophs you suggest. I reviewed 20+ papers on this subject. None of them offered any engineering assessment of the overall costs of making liquid fuels from carbon dioxide and none of them did a net energy analysis. Most of them dealt with new catalysts that might accelerate the carbon dioxide splitting reaction and simply claimed that the cost would be reduced. OK, from what old cost to what new cost with this catalyst? That question was never addressed. Fischer Tropsch systems have a very high capital cost even if you start with methane or coal. If you have to start with carbon dioxide present in the atmosphere, then you have to concentrate the CO2 to get the reaction to run at a reasonable rate. Concentrating CO2 from its 0.04 percent level in the atmosphere to 50% or so needed to run the reaction will really run up the capital and operating costs…and the energy input. If you then input more electricity to split the carbon dioxide molecule, you are going to need more capital and operating costs, and more energy. If you use nuclear power to provide the energy (electricity) for these operations, how much energy is required to build and operate the nuclear plant? I am just about certain that a net energy analysis would show this is a big energy loser. I am afraid our society is counting on speculative technologies like this carbon dioxide to fuels idea to replace oil and other fossil energy sources. I am afraid we are not planning very well for the day when oil and other fossil energy resources become so expensive and/or so polluting that we cannot use them any longer. We eventually will be forced to rely much more on renewable energy sources. But we have not really faced up to that reality as yet. I certainly agree with your 2 thoughts … we need to use energy more efficiently and we must have terawatts of renewable energy if “future inhabitants of the planet are to have the same opportunities that most of us have had.” I just think that building efficiency is not given the status it should have in the transition away from extractive based energy. Many think of building efficiency only as a bit of insulation and weather stripping. Deutsche Bank and the Rockefeller Foundation did a study a year or so back that estimated US buildings could save $1 trillion in energy over 10 year period. Achieving those savings requires only a $279 billion investment. A commitment by the investment community is the first requirement. Here are some examples of the scale of savings that can be achieved. …. Apple’s corporate campuses and data centers are now at 94 percent renewable and rising. Their data center in Maiden, N.C., relies entirely on renewable power. Two solar arrays provide more than 60% of that power. A 4.8 Bloom Energy fuel cell and electricity generated from methane gas at a nearby landfill produce additional power. More than 170 companies and investors, including EMC, Nike, KB Home, Starbucks, and Unilever, came out in support of the EPA rules. In addition to the environmental benefits of clean energy America’s largest companies see economic benefits. So far their savings mean more than $1 billion per year. The University of California Davis completed the first portion of the largest planned ZNE community to date. The design of 308 cottages and multi-family dwellings in CO will reduce energy needs by 80 percent through efficiency concepts including passive solar collection and extreme air tightness, even before solar and geothermal come into play. As part of Executive Order 13514, the federal government announced a goal that 100 percent of new federal buildings achieve ZNE by 2030. The Army recently began a pilot program to make five bases ZNE by 2020. Property managers in Chicago are targeting a 20% energy use reduction in the next 5 years. So, we can dramatically cut the amount of energy we require without moving backwards, but it does mean major investment dollars for retrofits and onsite renewable production. Finally, we really don’t have a lot of time to make the changes. The Hughes paper cited earlier by Charlie Hall is a nice summary of the perils of considering fracking as our energy savior. I would also add that methane leakage is a very big problem … proving to be much bigger than the EPA originally thought. Thank you, Jane. Good comments on the importance of building energy efficiency. One of my concerns is that we have this enormous built environment that is dispersed all over the landscape. How are we going to move people from their dwellings to this dispersed working environment in an era of decreased available energy for mobility? I would hope we could combine what we have learned about building energy efficiency with more dispersed, resilient work environments that are closer to where people live. Apparently that is beginning to happen. And, yes, we do not have a lot of time to make the needed changes. Agreed – and that number will only keep increasing because the global population will continue to grow and because developing countries will continue their electrification plans. 1.3 billion people worldwide still lack access to electricity, and even more live with limited electric access, hindering economic growth and prosperity. And the majority will continue to be from fossil sources for the forseeable future, unless energy diversification becomes a global priority. Even if fossil sources never get used up (avoiding the peak oil, gas, and coal debate), there are other reasons to diversify energy sources. For instance, in Sub-Saharan Africa and rural Asia where most of the world’s energy poor live, infrastructure is lacking to support centralized power generation. Distributed energy makes much more sense, so renewables and microgrids have a very important role to play. In the U.S., diversification is important for energy resiliency. Fossil fuels rely on transportation infrastructure – there are numerous reasons why that system can be interrupted. Distributed energy utilizing small-scale sources provides a measure of energy security. Whether or not a person believes that we will literally burn through all our fossil reserves, there are other reasons to diversify energy sources, including climate mitigation, reducing energy poverty (note: I believe fossil fuels as well as renewables have an important role to play to address this), non-carbon pollution reduction, ecosystem preservation and the aforementioned energy resiliency. Making energy diversification a priority now (rather than waiting for decades) will both bring down the cost of alternative energy sources and expand their use globally. Thank you, Dawn. I perhaps over stated (see below) that you agree with me about the need to develop renewables. What you said was that you thought we needed to diversify, and that fossil fuels have a role to play in alleviating poverty. I agree with those viewpoints. What I am arguing for is that we need to make a conscious decision to take part of today’s wealth, embodied as non-renewable energy, and use it to provide energy (wealth) for the long term. I strongly believe that is so. You have offered an interesting, albeit incomplete analysis of the “relationship between energy consumption, wealth production, and human well being.” What your analysis has done, is it has shown the important linkage of energy to human well being, as measured by HDI, along with the need to continue to grow the energy supply to maintain well being (with the current economic system). It has also demonstrated the need for much more energy than what we can see on the horizon. However, energy, as it drives the economy, is one of (at least) three complex systems that all are interrelated: Energy (both human labor and from the Sun and other sources); the Economy and monetary system; and the environment. Trying to explain this interrelationship only using three variables – Peak Oil, renewable energy, and HDI, does not fully describe the depth and breadth of our challenges. The last two hundred years, as you have pointed out, has seen an unprecedented growth in energy – actually a “surplus energy”, as it relates to what is required to produce food. The result has on the one hand produced significant improvements in well being for many humans (but only a small percentage of the total human population) on the planet, but it has also driven exponential population growth with accompanying exponential energy needs. This has produced exponential debt in the economy to maintain this growth. All of this is undeniably unsustainable – even before one considers the impacts of the extractive carbon-based energy economy on the environment. Our macroeconomic measurement of wellbeing – Gross Domestic Product, measures all economic activity the same – the good the bad and the ugly. It does not, however, measure other forms of well being like HDI and other measures such as Genuine Progress Indicator (GPI) do. Current macro-economic models do not account for the true cost of extraction of natural resources like oil, coal, and natural gas, nor does it account for the true cost of their pollution during extraction and economic activity. It essentially assumes that raw materials are “limitless” and that these unaccounted for costs are “externalities.” That kind of reporting may have been adequate for an “empty” world, but it is terrible(and possibly terminal) for the “full” (or “finite” per Gail Tverberg) world we now occupy. There are ample indicators showing that we have indeed reached Peak Oil, that environmental disasters like Global Climate Change and species extinction are “game over” changes for this system. So that means that if we wish to continue 1st world economies, requiring exponential energy, with exponential money (and debt), then we will need a major shift in the amount of energy required (similar to what we saw at the beginning of the Industrial Revolution) to sustain this economy. Which in my mind leads to the question as to why we are not pursuing major “Apollos Fire” type research into Breakthrough Energy? To use an innovation and technology example, we are powering our economy with 100-year old energy technology (Carbon (actually 4B years of “ancient sunlight”), and Edison’s electrical grid). Without it, you have “complex system collapse.” A few have spoken of the need for “Breakthrough Energy” previously, including the late astronaut Brian O’Leary. There have been, and are, others. To do this, however, both at once acknowledges the scope of the problem and it (again) poses an existential threat to the carbon-based energy industry that has fueled all economic activity for 200 years. There is still an incredible amount of power and money invested in this energy source for our global economy. No political leader or industry vested interests like to discuss wholesale system collapse, so instead there are debates over GCC (“Abrupt and irreversible changes.” From latest ICC report), Peak Oil, and the pros and cons of “renewables” vs carbon-based energy. These arguments ignore the proverbial elephant in the room. Making these systemic changes require incredible political consensus and will and navigating global governance – none of which do we have at this moment. All of the aforementioned does not even begin to address the Carbon-based energy industry’s tight connection to geo-political events, or “deep politics” and the interrelation of nation-states maintaining access to this energy through monetary and military policy. This is a “wicked problem” of the Nth order. Bottom line? We need a whole lotta energy, of a completely different type, to maintain current lifestyles without destroying the ecosystem that said (Developed) lifestyle and economy depend on. The alternatives are to “power down” and devolve in the types of economic activities that we participate in. Many humans are also exploring this – whether it is called “Transition Movement”, Resilience, Adaptation, “slow money”, “sharing economy” or other forms of non resource-intensive, simpler, economic lifestyles. These may be required anyway if/when the lights go out. Thank you, Jim, for your comments. I appreciate the reading list. The link to Gail Tverberg’s work is particularly useful. I will read them all. You made the connection between exponential growth and exponential debt–and the impossibility of continued exponential anything in the real world. Kenneth Boulding said it best when he observed that any one who thought that continued exponential growth on a finite planet was either a fool or an economist. (With apologies to any economists that might be reading this. :)) The brutal mathematical fact is that continued exponential growth of anything physical on a finite planet is impossible. As I post below, I don’t know of any “breakthrough energy”. We pretty much know what our energy sources are, and we know their pros and cons. I am afraid that kind of magical thinking will not lead us anywhere good. Having said that, I invite you and anyone else to provide me with good technical details on proposed energy sources. I will study them carefully. I thank everyone for their comments. It looks like this thread may have reached its endpoint. It has been five days since the last comment on my request for a response on the general principle I outlined above, that we need to build out renewable energy systems in order to maintain long-term prosperity. It appears that Dawn and Jane agree while Ike and Jim are counting on some sort of “breakthrough energy”. No one else apparently has an opinion on the question. 🙂 I have made or will make specific responses to individuals in this thread. You are welcome to read those if you wish. I confess, I don’t know what a “breakthrough energy” might be and have asked Jim and Ike for more information about their favorite candidates for “breakthrough energy”. I would like to know that there is some enormous unknown source of clean energy that will be inexpensive and easy to implement politically and socially. If that is so, then I can retire and enjoy my grand kids. Unfortunately, it seems like magical thinking, and is not likely to lead us along any good paths. We pretty much know what our energy options are, and we are going to have to make reasonable choices among those to meet our needs for heat, illumination, work and mobility. I simply think it is irresponsible to use non-renewable energy sources, and the wealth that these energy sources represent, without taking some fraction of that wealth and using it to build out renewable energy systems that will provide long term wealth. All of us save for retirement (I hope), consider this a societal savings program for the next generations. I missed this thread when it was posted, but want to say that I concur with very nearly eveything you have said. To avoid the highly uncertain, but very likely negative, impacts of climate change we need to eliminate fossil fuels as quickly as possible. The potential for carbon capture is often touted as the route toward using fossil fuels but eliminating CO2; I am skeptical because of slow technological progress and high costs of CCS, as well as a general uneasiness with burying our CO2 in the hopes that there will be no leaks or that future generations will be able to deal with it. That feels to me like the nuclear waste problem all over again. At the same time we are in an era of reduced availability of cheap fossil fuels, and while we have not properly accounted for large external costs of those fossil fuels (ref. NRC – Hidden Cost of Energy; Shindell) we have a large segment of the world’s population without access to modern energy systems (cooking, electricity). This combination is the problem, and renewables seem to be the only answer, together with large doses of energy efficiency in the industrialized world. For me the question is one of international institutions capable of helping cap carbon emissions and at the same time using a price on carbon emissions to enable sustainable development of energy systems (and thus, due to the linkage you discuss, better standards of living measured using a broad set of indicators). Thanks for your reply. I think the Breakthrough Energy I am discussing is not yet validated. To discover/achieve/exploit it requires a “Manhattan Project or Apollo Project” type research commitment. In my post, I mentioned the late Dr. Brian O’Leary, former Astronaut and author of the book “The Energy Solution Revolution.” There have been many pilots, and prototypes of potential new energy that could be explored with massive research dollars that will test the laws and bounds of physics – just like the Manhattan and Apollo projects did. “Free” or “Zero Point” energy, vacuum energy, cold fusion, advanced hydrogen, water technologies. You can read more about this from Brian O’Leary’s web site and follow some links that discuss this more. http://www.brianoleary.info. I think given the scope of our problems and the scope of our challenges, I think “magical thinking” is exactly what we need now. When JFK said to Congress in 1961 “I believe that this nation should commit itself to achieving the goal, before this decade is out, of landing a man on the moon and returning him safely to the earth.” Was that magical thinking on his part? As I explain in Chapter 6 of my book, U.S. Energy Policy and the Pursuit of Failure (Cambridge U. Press 2013), the Apollo Program and the Manhattan Project (technological demonstrations for political or military goals) are poor models for an energy program that is intended to lead to commercial application. I won’t summarize the arguments here, but as I wrote in an op-ed, when was the last time you had to choose between a trip Paris or a trip to the moon? While I have not read your book, just skimmed your Cato paper, several of your articles, and reviews of your book, we can agree on a few things. 1- There has been a policy failure the last 40 years when it comes to energy policy. My point is that this problem is larger than a pure market-based solution. Use Michael Porter’s 5-forces industry analysis, take a look at the market subsidies for the oil/gas/coal industry since its inception, then tell me that there are not Extreme market barriers to entry for something to replace it. We also disagree as to whether such a replacement is a market failure. If you believe as I do in the science of GCC and ecosystem destruction, then by definition, it is a market failure. I am OK with an energy policy that provides “stable rules”. Let’s globally agree that we need to REPLACE oil/coal/gas energy asap, while using it. Let’s globally agree to TAX it heavily, then reinvest those taxes in R&D. We can even give 50% of those taxes back to oil/gas/coal companies for them to conduct R&D to accelerate their own moves away from oil/coal/gas. But somehow, the argument seems to be a political one: the market and corporation policy for energy is not the problem, government policy is the problem. If governments, who clearly have failed in energy policy the last 40 years get out of the way, then the market will solve it. I do not think the Military-Industrial base would have developed all the rocket technology without government push (cold war), nor gone to the moon, nor developed the Internet. Why don’t you give us an example of non-government subsidized industry success? Please don’t tell me oil/gas/coal energy industry is an example, that would not be close to the truth. What would be close to the truth is that that industry continues to have a strangle hold on energy produced, to the detriment to the world. We need to set free market forces – Governments set the rules for markets, so they can “set stable rules” – make the offenders pay for it, then incentivise them and others to replace them. That is the policy that is needed.